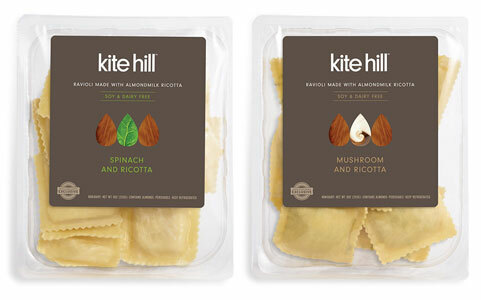 Next time you're craving delicious vegan cheese-filled pasta, grab a package of Kite Hill Vegan Ravioli and you'll take care of your hunger with the best in artisanal goodness! Packed with amazing flavors, these tasty raviolis cook up in boiling water in just 4-6 minutes, giving you authentic Italian flavors paired with wholesome vegan ingredients to bring you and your family the very best. Stuffed full of Kite Hill's deliciously creamy almond milk ricotta in every piece, you can choose from 2 delicious varieties: Spinach and Ricotta, or Mushroom and Ricotta (made with a delicious blend of portobello and shiitake mushrooms). 9 oz. (255g) packages are $8.99 each. If you have a great sauce you need something to put on, these would work. Not a lot of flavor, just bland. I can't find a good vegan ravioli. Sigh. From Anonymous of Santa Cruz CA, California on 1/28/2019 . The shiitake mushroom rav’s were a disappointing purchase. Bland and flavorless. If not for the sauce we made, it would have been a total wash.
From Jennifer of piscataway, New Jersey on 1/24/2019 . The mushroom one had small pieces of mushroom in the filling (it wasn’t completely puréed, which was nice). The flavor was mild, and it was a lovely ravioli. I appreciated that the cheese filling didn’t taste like potatoes. Mild flavor overall. From Marianne D of Schaumburg, Illinois on 12/13/2018 . Love, love, love these. I'm reordering right now! I love their yogurt so I decided to give these a try and was so happy I bought them! They taste delicious! It's a pricey product, but it is pretty filling. I split it in half and freeze the other half for another day. Fully recommend!